Hungary – The Golden Team that never quite made it. Home Classic Hungary – The Golden Team that never quite made it. When you look back at the history of past World Cup winners and European Championship winners the usual names by in large stand out. Brazil, Germany, France; you know the drill. But perhaps you don’t know about one of the greatest sides Europe’s ever seen that now ranks 52nd in the World, below the likes of Iceland, Peru and Costa Rica, and over a 6-year spell from 1950-1956 only lost one competitive match of football. That one match was the World Cup Final in 1954. “The Miracle of Bern”. West Germany vs Hungary. Hungary were the tournament favourites and swept aside a reserve West Germany side 8-3 with striker Sándor Kocsis scoring 4 in their last group match and progressed to the Quarter Finals against Brazil in an infamous clash which is now known as “The Battle of Berne” due to the English referee Arthur Ellis having to send off 3 players due to violent conduct. The match was played in awful conditions which made the ball hard to control and tackles much riskier. Hungary won the match 4-2 with Kocsis bagging another 2 and they progressed to the semi-finals where they would face Uruguay. This match also ended 4-2 in favour of the Hungarians after extra time thanks to another two goals from Kocsis and Hungary were on track to pick up the trophy, meeting all the pre-tournament expectations and feeling very confident facing West Germany, the side they had beat 8-3 in the group stages. Legendary striker Ferenc Puskás returned from a two-game injury suffered when Hungary had played West Germany earlier and his impact was felt as the striker found the back of the net after just 6 minutes on the clock. Zoltán Czibor doubled the Hungarians lead just 2 minutes later and Hungary looked on course to replicate their 8-3 thrashing of the Germans in the Group Stages to land them the trophy. West Germany however, had other plans. Maximilian Morlock pulled one back for the Germans in the 10th minute and just 8 minutes later, Helmut Rahn drew the scores level. Hungary took control of the game after that and peppered the German goal and came within inches of scoring on multiple occasions and came out in the second half exactly as they started. They had complete control of the game and Germany had their first chance of the second half in the 72nd minute. Hungary still looked in charge but in the 84th minute, Rahn scored his second of the game from inside the box and West Germany took the lead. Hungary went into overload at that point and threw everything they had at the Germans. Puskás scored however the goal was ruled offside and in the dying minutes, Hungary had another golden chance denied from short range. The whistle soon thereafter ended not only the match, but also the Golden Team’s unbeaten run. What made Hungary’s Golden Team just so good? Hopefully this article will be able to answer that question for you. So, we’ve already established this was a formidable Hungary side to say the least but how were they made up? Well the manager was Gusztáv Sebes, a former player himself who had been working as a trade union organizer in Budapest after the war. Sebes built the side around 6 key personnel. Ferenc Puskás, Sándor Kocsis, Nándor Hidegkuti, Zoltán Czibor, József Bozsik and Gyula Grosics. These 6 players were constants in Sebes tactic and pivotal to Hungary’s success. Sebes used a 2-3-3-2 formation however it could also be described as a 3-3-4. He implemented a number of revolutionary changes to Hungary’s international set-up including fitness regimes for each individual player and a more ‘club like’ policy to create a tight knit social group. Tactically, Sebes was also revolutionary. He strayed from the standard ‘WM’ formation made famous by Herbert Chapman where the centre forward spearheaded an attack line of 3 forwards and 2 wingers, and instead introduced the concept of a deep-lying centre forward to the international scene. Sebes’s tactic was to withdraw the centre forward back to the midfield, as well as dropping the wingers back to the midfield when necessary. This effectively created an extremely flexible 2–3–3–2 formation, allowing the team to quickly switch between attack and defense. The tactic also drew defenders out of position, as centre halves used to man-marking a centre forward would follow the deep-lying centre forward back to the midfield. What many people don’t realise is that the Hungarian’s and Gusztáv Sebes’ ‘Golden Team’, were responsible for the creation of Totaalvoetbal that is now synonymous with the great Ajax sides of the 1970’s and Hollands 1974 team. Sebes wanted his players to be able to play in any position at any time, just like Rinus Michels and Pep Guardiola, and this was an early form of Total Football. Ferenc Puskas commented on it saying, “When we attacked, everyone attacked, and in defence it was the same. We were the prototype for Total Football.” Players were constantly moving and changing position according to a pre-arranged plan and this meant that the Hungarians could play fluid football, with some fantastic passing and movement and the opponents could never scout them properly, because their movement was arranged pre-game. 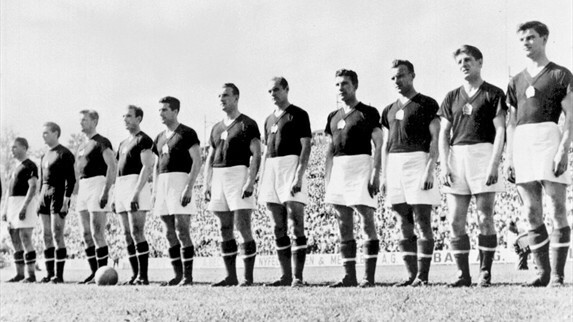 The reason why the Hungary side of the early 1950’s is coined the ‘Golden Team’ is to do with the sheer abundance of quality the side had in it’s ranks. Gyula Grosics was one of the best goalkeepers in Europe at the time and Lantos, Lorant and Buzansky made up the rest of the backline. These players had played together for years and with Sebes’ club like atmosphere, became a very tight night and impenetrable defensive line. In midfield Jozsef Bozsik and Zakarias screened the defence, rarely roaming forward and instead supplying balls over the top of opposition defences for the attackers. Sometimes they even formed part of a back 5 when Nandor Hidegkuti, who played as a trequartista, dropped into midfield. The role Hidegkuti played as a trequartista was yet again a revolutionary innovation as most international sides, including Hungary before 1949, played with a traditional number 9 who would simply outmuscle and bombard opposition defences with their power. Hidegkuti was tasked with dropping deep at times to pick up the ball before distributing it the flanks or to the front 4. Those front 4 were formidable and one was arguably one of the greatest players of all time. Lazslo Budai and Zoltan Czibor were on the flanks, not so much wingers as wide strikers, while Sandor Kocsis partnered Ferenc Puskas centrally. Puskas was of course the focal point of this front 4 however the other 3 forwards were just as capable and in fact, Sandor has a better goal to games ratio for the Mighty Magyars than Puskas himself. Kocsis scored 75 in 68 while Puskas scored 84 in 85. Hello, my names Finley Armstrong, I’m a 17-year-old aspiring football analyst from the Shetland Islands in Scotland. I’ve been a lifelong Arsenal fan and have recently started to properly study and read about some of the greatest footballing tacticians in history such as my personal hero Johan Cruyff. I love to write about football from the mid-20th century as well as Arsenal.